Well, I’m at the end of another season of workshops and it’s been a great year!!!! I love teaching and it is really a pleasure to see so many students see their own work get better and better! I don’t take credit for that, but I do attribute that to their hard work, but it’s nice to know I’ve steerred them in the right direction! Around the end of each season I realize that I’ve learned even more myself and have learned some new things about how to make a workshop more fun and productive. I thought it would be nice to share those thoughts with you! So here goes some suggestions, insights and observations that can make 2017 even better for all of us! 1. Don’t take it so serious, but then do take it serious enough!!!! A workshop should be a lot of things; a learning expereince, a time to get better at your craft, a time to get in touch with your own visioin, and it should be fun, lots of laughter, lots of new friendss, and fellowhiop with old ones. When you get home you should feast on all those magic moments standing before grandeur with people you really enjoyed being with! Your goal should be to learn and put yourself under a little pressure to really get a little better, but not to the point that it ruins the fun aspect of a workshop. No none ever goes to a workshop as beginner and leaves a seasoned master of the craft, that takes time, practice and lots of field time and study! Accept each workshop as a step in the direction you want to go to, and enjoy it!!!!! 2. Come ready to embrace the experience! Workshops are frantic and the hours are long, the learning intense and the scenery is often overwhlming! You need to arrive at a workshp rested, and you’ll need a recovery time after one!!! If you are rested you will learn better and hear more of what is shared with you! Concentration is required to pick up on all the things that get shared, and passed along. 3. Be sure you pick the “right” workshop! Research the workshop company and see what others that have attended have to say about the experience. The word gets out about workshops, some are truly well planned and run by expereinced leaders that put the students first, others, not so much! There are a lot of really good workshops run by great shooters and instructors, but some are not so well planned and not all instructors are effective teachers or care a great deal about the students learning. That is not meant as criticism, but for the last few years I’ve been working with one of the best workshop providers in the business, Jack Graham. Jack says he learned it all from me, and I doubt that seriously, but if he learned anything from me, he has worked very hard to build it into much more. You worked hard for your money, spend it wisely! 4. Know your camera! It is very important that you know how to set your camera, and you have your camera manual close-by! 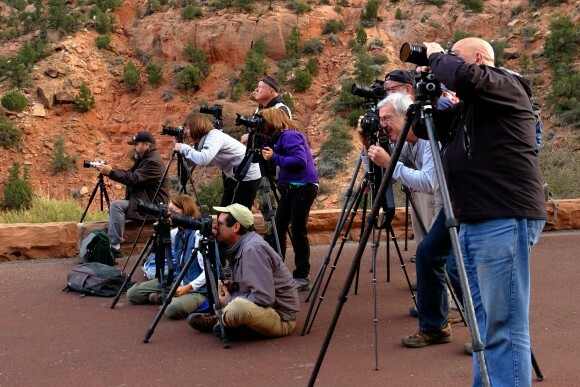 A good instructor will help you get the most out of your camera and lenses. When the light is perfect, you want to be capturing it, not fiddling with your camera!!!! We worry a great deal about whether or not we havve enough mega pixles, when we all have cameras that can make amazing images, we will be better off if we simply learn how to use the camera we already have!!!! 5. This is a tough one, accept that when you submit images for review that the instructors will still find areas that you need to improve on. It’s easy to start to believe we are incredible photographers, I’ve even thought that about myself, but the reality is we are all students needing to learn more and make improvements. A review can help us sort out what we need to improve on. If you truly want to get better, you have to accept that we are not there yet, I certainly know I’m not, and it keeps me hungry to learn and get better! 6. Try to help your instructors to give you what they want you to have, a great experience! Know that your leaders have worked really hard to be sure they get you to the best spots in the best light, (when possible), and they really want you to learn and have fun! Understand that the leaders often get to the workshop location a few days early to finish the work they do for you. Even though it is tempting to try to find them and hang out with them for those extra days, it is not fair to the rest of the attendees if the leaders don’t get their scouting and planning finished. The hardest thing for a leader to do is to not spend time with valued students, in many cases old friends, but our greatest obligation is to make the right peparations for all our guests! After all, your experience is paramount! 7. Make sure that the workshop you are attending is the right level for you! Some workshops are aimed at the beginner others to intermediate photographers some to only the very advanced! Ask your leaders when looking into a workshop if they think you will be a good fit for them, and they will be a good fit for you!! A good workshop leader will not steer you wrong just to get your money!! I hope that helps as you think about where to attend a worlshop in 2017! All these are important and are to be given great consideration and attention. If by chance you find this overwhelming to think about — then just go to a Bill Fortney workshop and if you do your part as an attendee, I can guarantee he will do his part as an instructor/leader!! Thanks Mike, freinds like you make it all worthwhile! Solid advice! Maybe rework #4 to read: Bring your camera’s manual. As an old Canon shooter I could pretty much muddle through the basics of a Nikon and I’m sure you could do the same with a Canon. But they are no longer the only games in town and newer models have a plethora of features that are not always standardized. There may be a simple explanation to solving a problem but a camera manual in the box won’t help. Good number 8, I agree!!!! So very well-stated. Your gentle tone and words should not hide a central duty of each of us participants … arrive with an equally humble and gentle desire to learn. Proud spirits can get in the way of the entire experience. Thank you for the advice. Thanks Jim, you are the “Poster Child” for humility!!! the most important aspects of all for an attendee, and what I struggle with the most, namely, get over yourself, embrace the experience, be a sponge, and I can learn something from everybody, including the beginner that might be next to me. I think if I ever had the time and money to take a workshop with you it would be more for fellowship than anything else so I wouldn’t mind if I didn’t match up with the tour 100% as long as I didn’t annoy the teachers too much. Getting to know other photographers, especially if they are Christians, would be wonderful — learning new things and seeing new places would just be gravy.